I am an experienced guest speaker who brings my presentations to life by using comedy, audience engagement, magic and audio. 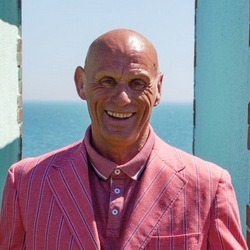 I’ve performed for hundreds of groups, clubs and societies and appeared in my own one man show at The Edinburgh Fringe and The Brighton Fringe. I stand alone, use very little equipment, (which I provide myself), and only require access to a three pin plug socket. I will require access to the venue at least fifteen minutes before start time. Please note that payment in cash is preferred. The Baby Boomer Nostalgia Show is an amusing celebration of being born between 1946 and 1964. It explores what shaped and inspired a whole generation which, according to Prime Minister Harold Macmillan, “never had it so good’. This fifty minute show is packed with funny memories and is a perfect antidote for clubs and societies that are fed up with modernity and want to wallow in a good old bit of nostalgia. The show features comedy, audience participation, magic and some audio reminders of the time.